For decades, AMG has created engines for globally sold Mercedes-Benz models, which is why it’s so hard to imagine that the two companies were not always intertwined. AMG’s founders, Hans Werner Aufrect and Ernhard Melcher, created the original business back in the late ‘60s to provide the industry with top-notch, race-worthy engines. 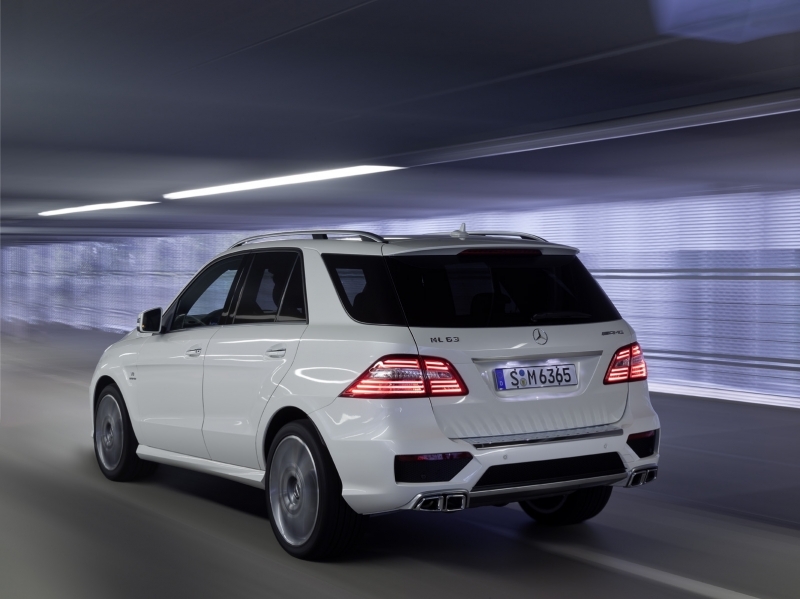 What they perhaps didn’t anticipate was that an AMG engine would one day be used to power a 5,000-lb SUV. But what an SUV! With permanent four-wheel drive, a 518-horsepower twin-turbocharged V-8, and suspension settings that make it equally superb in tight corners and suburban streets alike, the 2012 ML63 AMG is a beast of a powerhouse. Additionally, everything that we disliked in the standard ML has been eradicated in the ML63. Styling cues on the interior are sportier, more options are now on the standard list, and – most importantly – that annoying body roll that nearly ruined the ML for us is thankfully absent. Really, we’ll have trouble not singing its praises for the next 1,000 words, because, in short, the ML63 AMG might be the best SUV we’ve ever driven. Nearly everything. The comfortable cruising speed on the ML63 is near ludicrous. The 518 hp biturbo engine doesn’t suffer from turbo lag and delivers impressive acceleration. Interior luxury is top notch, and styling modifications make the ML’s look fit the sporty AMG image more appropriately. Stop/start feature improves fuel economy. Fine. We’ll come up with something negative to say: Some of the safety systems can be too intrusive; Our ML initially refused to move across the middle line to safely pass a bicyclist, which we’d consider to be a poor time for the Active Lane Keeping Assist to kick in. Pricing is considerably higher than BMW’s X5M, and the Performance package, which adds some muscle, is an extra cost. We won't go into detail about the regular ML's drive, but we can say with certainty that the ML63 is miles better. Body roll, which was a persistent problem, is nearly nonexistent, thanks to Mercedes’ Active Curve Control and Air Suspension. It’s frighteningly composed on the road, so much so that you’ll find yourself cruising at highly illegal speeds unawares. But that’s the beauty of this machine; it’s so fantastically fun to drive that you regularly forget that you’re behind the wheel of an SUV instead of a road-skimming sports car. The smooth-sounding biturbo V-8 delivers instant acceleration from off the line, passing is effortless, and downshift blips sound sonorous. Suspension settings are adjustable, meaning that you’ll be able to swap in and out of sport mode, comfort mode, and manual mode as you like. Even on its stiffest setting though, the ride doesn’t feel too harsh; instead, it adjusts well to all road conditions. Safety systems tend to inhibit the ML63 a tad (see “What’s Not to Likeâ€); understeer can be corrected by turning off traction control, however, and driver input isn’t rendered too automated. This is the first application of the AMG's 5.5-liter biturbo direct injection V-8 in an SUV, and the 518 horsepower and 516 lb-ft of torque feel ever so much at home in the ML63. A 0-60 mph time of 4.7 seconds and top speed of 155 mph are numbers you’ll see out of the box, but the performance package delivers a bit more. By increasing the turbo boost, the performance package bumps horsepower and torque up to 550 and 560, respectively, dropping the 0-60 mph time by 0.1 second, and adds a full 19 mph to the electronically limited top speed. The Speedshift seven-speed automatic transmission is brilliantly quick in automatic mode, but the manual mode isn't as on the ball, and shifts seem slightly sluggish. It’s easy to get used to hearing magnificent engine blips as it swaps gears. Permanent four-wheel drive is standard. If you're considering buying a large SUV with a V-8 engine, there's a high likelihood that fuel consumption isn't exactly a priority. Still, this newest ML sees a 28 percent increase in economy over the outgoing model, thanks in part to the more efficient engine and the auto stop/start technology. The system will turn off the engine when the vehicle comes to a stop, reducing the amount of fuel burned. We love seeing the long list of features that come standard with the ML63 AMG, but driving it along with all the bells and whistles had us wondering if the point where electronics are too intrusive in the drive had been reached. The safety systems do a great job preventing accidents, but spirited driving conditions had the seat belts tighten up on us prematurely. And we’ve already mentioned the Lane Keeping Assist's overly heavy hand. Not all of it had us worried though. The Comand system features real-time traffic and weather information, Bluetooth audio streaming, and a rearview mirror within its seven-inch display. And comfort comes in the form of a power lift gate, 10-way power seats and lumbar support, and a 14-speaker harmon/kardon surround-sound system. The already good-looking ML interior gets extra luxurious in AMG guise. Peaking through the spokes of the flat-bottomed steering wheel are a 4.5-inch information screen and surrounding bright gauges. Perforated leather seats are sumptuously comfortable, and even the rear seats can be heated (as an option). The designo trimmings are stunning touches, but the Dakota Brown leather is a standout. Cooled cup holders and an optional panoramic sunroof are just a few treats for the occupants. This third iteration is a distinct departure from the original ML launched in 1997. The design is less rounded, the headlamps more angular, and the grille more aggressive. It’s grown slightly, and the exterior is accented by chrome, long, sweeping bodylines, and hidden tailpipes. Where the AMG treatment was dramatic for the interior, the exterior’s changes are subtle, mostly having to do with badging and wheels (20â€ are standard with available 21â€ alloys). 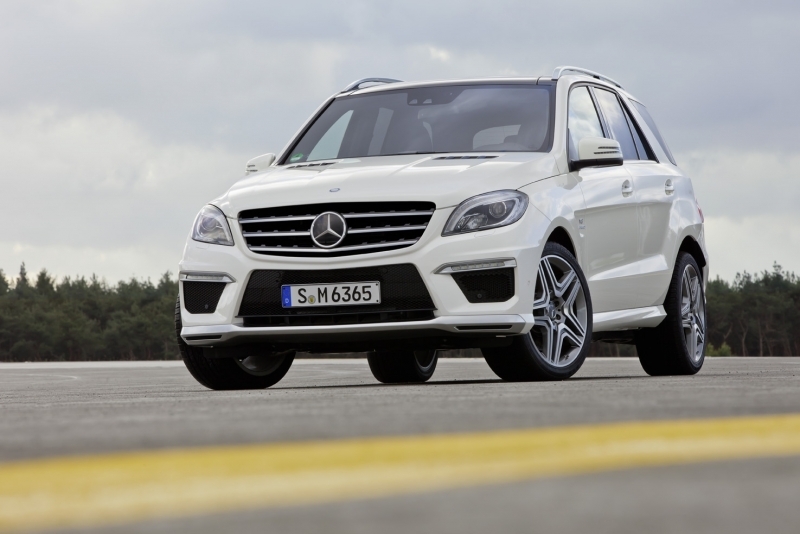 Mercedes has cleverly placed the ML63 AMG between its two main competitors: the BMW and Porsche. BMW’s X5 M and X6 M offer performance levels similar to the ML’s, but come in a few thousand less than the ML62’s starting price of $95,895. Porsche, on the other hand, has priced its Cayenne Turbo at $107k. All will have extras that can easily see you adding to the bottom line. We’d have a hard time convincing you why not to buy the ML63 AMG, as long as you’re in the market for an SUV with a bit of a price tag. It transitions so brilliantly from sporty road gymnastics to normal, everyday driving that we’re convinced Mercedes has somehow blended chameleon genes with those of a car. Hey, if it’s possible, you can bet this car company will be the first to do it.